What Is Biotin & How Does It Affect Hair Growth & Health? Neurologic symptoms such as depression etc. If you observe any symptom, then consult a doctor. There are several reasons which reduce the biotin level and can cause the deficiency. Most common reasons are the gastric issue, taking some medicine for so long, use of antibiotics, smoking or due to malnutrition. Normally biotin requirement varies for different age groups such as for children is 8-12 micrograms per day while for adults it is 30 micrograms per day. Biotin helps to maintain healthy hair, nails and prevent them from being brittle and dull. Biotin is added to hair growth supplements which nourishes the thin hair and promote hair growth. If your hairs are getting thin day by day or started to discolor then, this may be the symptom of biotin deficiency. Our hair, skin, and nails are made up of keratin protein, which is regulated by biotin because it improves the body biotin’s infrastructure. Taking biotin rich supplements and foods helps in improving hair thickness, but it only happens if the thinning of hair is due to deficiency of biotin. Hair loss can be due to various conditions such as genetic factors, some deficiency or using the wrong shampoo. So if your hairs are becoming thin gradually along with a change in texture, you must consult the doctor to identify the root cause. If tests show biotin deficiency, the doctor will recommend you some supplement along with biotin enriched food. This will overcome the deficiency that speeds up the hair growth and helps the people suffering from hair loss. There is no scientific data reported yet that shows how biotin helps in hair growth except maintaining keratin infrastructure. It helps men and women to regain hairs back but it has no effect on male pattern baldness. It is usually recommended when a person is suffering from hair loss issue as it stops hair fall, but it doesn’t reverse the male pattern baldness. It lowers the bad cholesterol in the body and increases the good cholesterol levels, which prevents from heart diseases. Biotin significantly reduces the blood sugar levels in diabetic people. It improves the mental performance and prevents depression and other related diseases. In case of severe biotin deficiencies, biotin supplements are advised by doctors to fulfill the body requirement. Normally people take their biotin from foods and from gastrointestinal bacteria. Doctors advise biotin supplements to pregnant and lactating mothers because they need more biotin as compared to the normal adult. 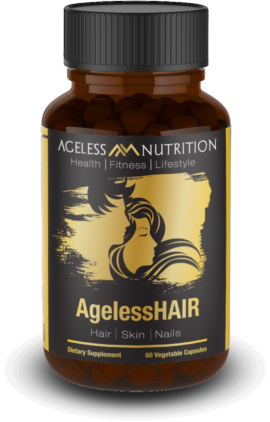 The AgelessHAIR all natural supplement includes 5,000 mcg of biotin and is combined with other ingredients to promote healthy hair, skin, and nails. All of these supplements are safe to use and provide health benefits but if you feel any difference or get any unwanted symptoms then stop taking a supplement and consult the doctor. Although biotin is essential vitamin and is vital for various body mechanisms but try to take it from food. The biotin that is taken from foods doesn’t cause any side effects, but you fulfill that deficiency by supplements that may cause side effects. Biotin improves hair growth and thickens them so eat healthy to get a well-nourished hair and skin. There are shampoos available which contain biotin, so you can try them if you are not tolerant of biotin supplements. If you notice any symptom after taking a biotin supplement, consult the doctor as soon as possible.